The getting ready space at the Ann Norton Sculpture Gardens in West Palm Beach, Florida is small, and best for the finishing touches for your preparations after the rest of the preparations have been completed elsewhere (or if your party is very small). Natural daylight sifts in through small, old-fashioned windows with a southern exposure, giving the space a general feeling of dimness, with soft, romantic touches. Finding places to hang a wedding dress to have a natural connection to the scene being photographed is our personal preference, though when this is not possible we will sometimes find another spot for the dress to hang to be documented. Generally we believe that the wedding dress looks best hanging on the bride rather than on a hanger, but sometimes it's a visually interesting way to tie the wedding day to a specific location by documenting the dress on its own. 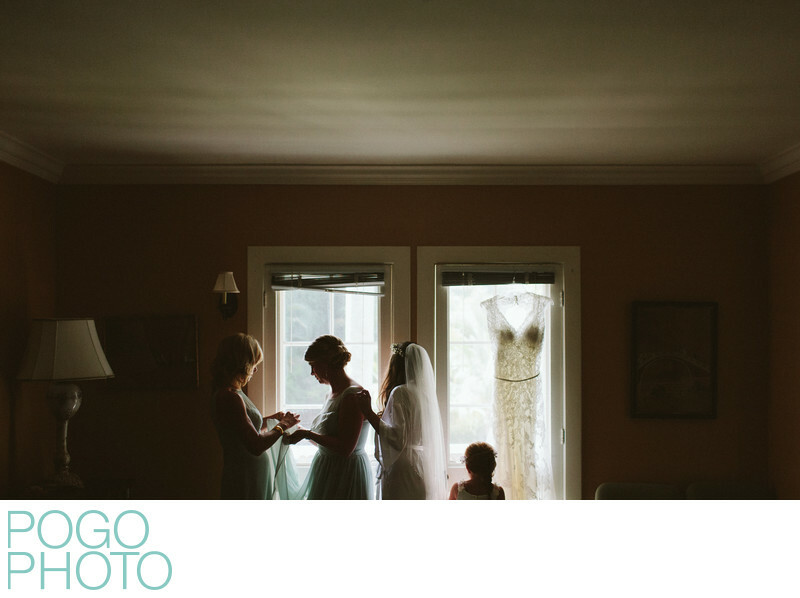 In this case the connection felt by the various hands working on getting a bridesmaid dressed, including those of the bride (identified by her veil) tell a story of their own, while the dress hanging on the door frame speaks of what's about to happen. Visually this image captures the feeling of the room, without including the busy conference table covered in small items from the group's preparations. 1/1250; f/2.0; ISO 800; 35.0 mm.